For other uses, see Doctor Dolittle (disambiguation). 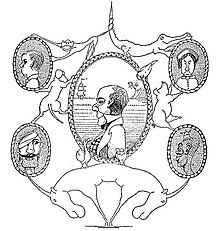 Doctor John Dolittle is the central character of a series of children's books by Hugh Lofting starting with the 1920 The Story of Doctor Dolittle. He is a doctor who shuns human patients in favour of animals, with whom he can speak in their own languages. He later becomes a naturalist, using his abilities to speak with animals to better understand nature and the history of the world. Doctor Dolittle first appeared in the author's illustrated letters to his children, written from the trenches during World War I when actual news, he later said, was either too horrible or too dull. The stories are set in early Victorian England, where Doctor John Dolittle lives in the fictional English village of Puddleby-on-the-Marsh in the West Country. Doctor Dolittle has a few close human friends, including Tommy Stubbins and Matthew Mugg, the Cats'-Meat Man. The animal team includes Polynesia (a parrot), Gub-Gub (a pig), Jip (a dog), Dab-Dab (a duck), Chee-Chee (a monkey), Too-Too (an owl), the Pushmi-pullyu, and a white mouse later named simply "Whitey". One inspiration for his character appears to be the Scottish surgeon John Hunter. The Story of Doctor Dolittle: Being the History of His Peculiar Life at Home and Astonishing Adventures in Foreign Parts Never Before Printed (1920) begins the series. The sequel The Voyages of Doctor Dolittle (1922) won the prestigious Newbery Medal. The next three, Doctor Dolittle's Post Office (1923), Doctor Dolittle's Circus (1924), and Doctor Dolittle's Caravan (1926) take place during and/or after the events of The Story of Doctor Dolittle. Five more novels followed, and after Lofting's death in 1947, two more volumes of short, previously unpublished pieces appeared. "The Story of the Maggot"
Gub Gub's Book: An Encyclopaedia of Food (1932) is purportedly written by the pig. It is a series of food-themed animal vignettes. In the text, the pretense of Gub-Gub's authorship is dropped; Tommy Stubbins, Dr. Dolittle's assistant, explains that he is reporting a series of Gub-Gub's discourses to the other animals of the Dolittle household around the evening fire. Stubbins also says that the full version of Gub-Gub's encyclopedia, which was an immense and poorly-organized collection of scribblings written by the pig in a language for pigs invented by Dr. Dolittle, was too long to translate into English. Doctor Dolittle's Birthday Book (1936) is a little day-book illustrated with pictures and quotations from the earlier stories. It appeared between Doctor Dolittle's Return and Doctor Dolittle and the Secret Lake. "Doctor Dolittle Meets a Londoner in Paris" is a short story included in The Flying Carpet, pp. 110–19 (1925), an anthology of children's short stories and poems with illustrations by Cynthia Asquith. The main events of The Story of Doctor Dolittle take place in 1819 or 1820, although the events of the early chapters seem to be spread over several years. The Voyages of Doctor Dolittle begins in 1839. Backstory references indicate that Dr. Dolittle travelled to the North Pole in April 1809, and already knew how to speak to some species of animals at that date, suggesting that the early chapters of The Story of Doctor Dolittle take place before that date. However, it is possible that the internal chronology is not consistent. 2019: The Voyage of Doctor Dolittle, a new live action adaptation starring Robert Downey Jr., Michael Sheen, and Antonio Banderas. A Russian children's novel Doctor Aybolit (Doctor Oh-it-hurts) by Korney Chukovsky (first published in 1924) was loosely based on the stories of Doctor Dolittle. 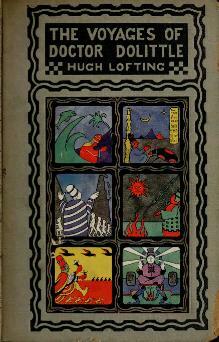 The original novel credited Lofting's work, as did Chukovsky in his memoirs. Norwegian playwright, songwriter, and illustrator, Thorbjørn Egner, made an album called Doktor Dyregod (Doctor good-toward-animals) with songs and story based on Doctor Dolittle. All the books in the series have been translated into Japanese by Ibuse Masuji and into Lithuanian by Pranas Mašiotas (few decades after appearance of an original). ^ Goddard, J. (2005). "The Knife Man: the Extraordinary Life and Times of John Hunter, Father of Modern Surgery". J R Soc Med. 98 (7): 335. PMC 1168927. ^ Conniff, Richard (27 February 2011). "How Species Save Our Lives". The New York Times. Retrieved 2011-03-31. ^ "Of course now, when almost everybody in the whole world has heard about Doctor Dolittle and his books, if you were to go to that little house in Puddleby where my father had his cobbler's shop you would see, set in the wall over the old-fashioned door, a stone with writing in it which says: 'JOHN DOLITTLE, THE FAMOUS NATURALIST, PLAYED THE FLUTE IN THIS HOUSE IN THE YEAR 1839.'" — The Voyages of Doctor Dolittle, part 1, chapter 6. ^ "Yes, I discovered the North Pole in April, 1809. But shortly after I got there the polar bears came to me in a body and told me there was a great deal of coal there, buried beneath the snow. They knew, they said, that human beings would do anything, and go anywhere, to get coal. So would I please keep it a secret." — The Voyages of Doctor Dolittle, part 2, chapter 11. ^ "Dr. Dolittle and His Animals" – via www.imdb.com. ^ a b "Doctor Dolittle (1967)". Turner Classic Movies. ^ "Doctor Dolittle" – via www.imdb.com. ^ Alan Bennett: Doctor Dolittle Stories: Classic readings from the BBC archive (Classic Readings from the BBC Archives): Amazon.co.uk: Hugh Lofting, Alan Bennett: 9781785296833: Books. ASIN 1785296833. ^ "The Voyages of Young Doctor Dolittle" – via www.imdb.com. ^ "Robert Downey Jr. to star in The Voyage of Doctor Dolittle". The List. 21 March 2017. ^ Kuriy, Sergei (4 April 2012). Является ли "Айболит" К. Чуковского плагиатом "Доктора Дулиттла"? [Is Chukovsky's Doctor Aybolit a plagiarism of Doctor Dolittle?] (in Russian). Retrieved 24 October 2013. In 1924, Dolittle garnered noticed in Soviet Russia. A publisher ordered two translations. The first was designed for older children, and was written by E. Khavkin. This version was subsequently forgotten and never republished. The second version bore the title Гай Лофтинг. Доктор Айболит. Для маленьких детей пересказал К. Чуковский [Hugh Lofting. Doctor Veterinarian. For young children, as told by K. Chukovsky]. ^ Chukovsky, Korney. "The Story of my 'Doctor Dolittle'". Archived from the original on 13 February 2008. Retrieved 24 October 2013. Wikimedia Commons has media related to Doctor Dolittle.